Sometimes, a transformation does not solve the problem of a relationship between the differences and magnitude. For example, this could occur when differences are negative for low values and positive for high values. To illustrate these concepts, we will use another example from Bland & Altman’s 1999 paper. 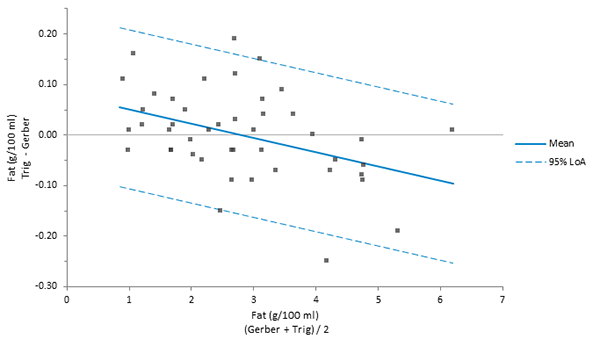 In this example, the fat content of human milk was measured by enzymic procedures for the determination of triglycerides and using the standard Gerber method. The analysis report on the Fat worksheet shows that the differences are related to the magnitude, although the variability looks fairly constant throughout the measuring interval. On the Analyse-it ribbon tab, in the Method Comparison group, click Estimate Agreement Limits. The Fit Differences task is added to the analysis task pane. In the Mean function drop-down list, select Linear. The difference plot shows the average bias estimated using a linear regression. The limits of agreement are estimated using the residual standard deviation from the regression. The p-value of the slope term is significant (p < 0.05) and confirms that the average difference is related to the magnitude. If we suspect that the variability of the differences is also related to the mean, we could model the SD using the residuals from the fit.